They were also actively opposed by many of those who resisted the First World War. World empires and colonies in 1914, just before the First World War. Image by Andrew0921 on Wikimedia Commons. The very term ‘The First World War’ is actually highly ideological in nature. Viewed from the Global South there was already a ‘world war’ in progress on 27 June 1914: namely, a war by the European (and American) empires against much of the rest of the world. Indeed, ‘[b]etween 1800 and 1914 the proportion of the earth’s surface occupied by Europeans, whether in colonies or former colonies, rose from 35 to 84.4 per cent’  – and the process whereby this happened was very far from peaceful. Winston Churchill (then First Lord of the Admiralty) in 1912. Source: Wikimedia Commons. Surviving Herero after the escape through the arid desert of Omaheke in German South-West Africa (modern day Namibia), c. 1907. Source: Wikimedia Commons. 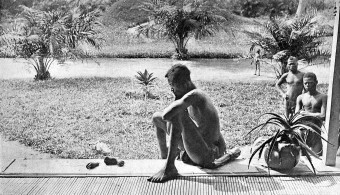 Worse than any British ‘excess’ (the choice of words is in itself highly revealing) it might have been, but in absolute terms it paled before Belgium‘s then-ongoing genocidal depredations in King Leopold’s singularly ill-named Congo Free State. 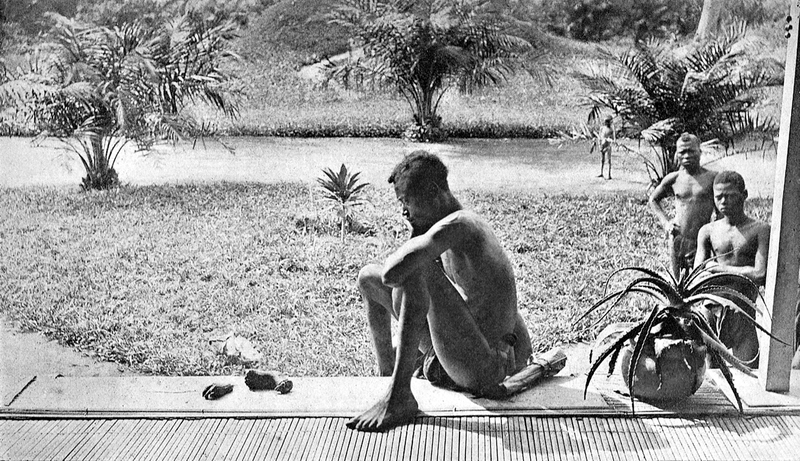 Nsala sits with the hand and foot of his five-year-old daughter, Boali, 1904. The systematic cutting off of hands by Belgian colonists and their proxies was widely practiced in King Leopold’s Congo. Photograph: Alice Seeley Harris. Source: Wikimedia Commons. The French bombardment of Casablanca as reported in the Sydney Morning Herald. After Britain signed its 1907 Convention with Russia, the British socialist newspaper Justice condemned the agreement as ‘a pact between predators’ who had come to terms over their ‘respective areas of spoliation.’  Despite promising to ‘to respect the integrity and independence’ of Persia, the Convention actually divided the country into a Russian zone (north), a middle zone (neutral), and a British zone in the south-east – and the two powers had no intention of letting Persians run their own affairs. 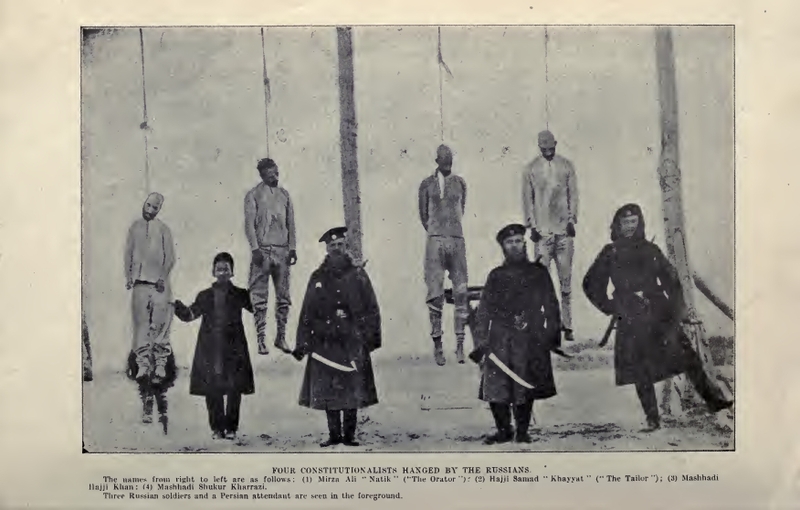 Four Persian constitutionalists hung by Russian forces in 1911 /12. Source: Edward Browne, ‘The Reign of Terror At Tabriz’, 1912. Italian atrocities in Libya, as reported in the Poverty Bay Herald in November 1911. Italy and the United States were both latecomers to the First World War, joining the Allied Powers in 1915 and 1917 respectively, but both already had ample blood on their hands. Such reports would appear to undermine Hastings’ claim that German atrocities in Belgium were ‘different’ because ‘it wasn’t just a question of the odd soldiers [sic] brutally murdering a few civilians, they were systematically shooting them in scores, and sometimes in hundreds, as hostages’  – at least if the life of an Arab is to be granted the same value as that of a Belgian. 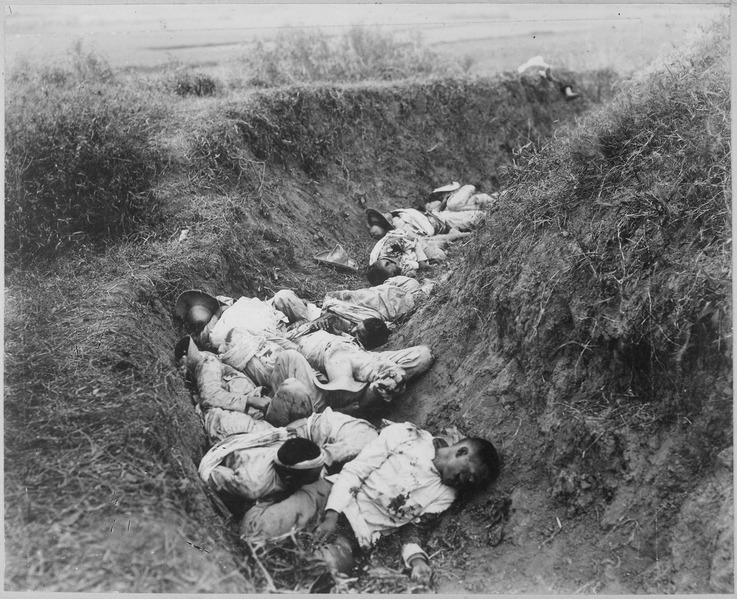 Dead Filipinos in a trench during the Phillipine-American war (1899 – 1902). Source: Wikimedia Commons. US President Woodrow Wilson also got in on the act, invading both Haiti (1915) and the Dominican Republic (1916) before joining the Allied Powers. 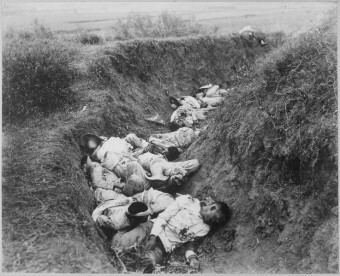 In Haiti, the ensuing war claimed the lives of an estimated 15,000 Haitians, with the US occupation lasting until 1934. So much for our ‘allies’, but what of Britain itself? Here again, the record – if honestly faced  – is extremely grim. A painting of the Battle of Omdurman, 1989. Source: Wikimedia Commons. 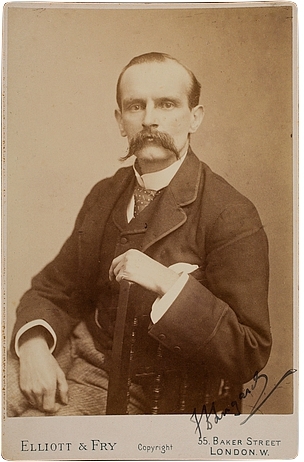 Frederick Lugard, 1st Baron Lugard, butcher of Satiru. Source: Wikimedia Commons. Famished children taken into care by missionaries in Indian town of Jabalpur C. P. 1897. Source: Wikimedia Commons. Imperialism , and the international tensions and alliances it gave rise to, played a major role in enabling the cataclysm that was the First World War. It also helped to nix pre-war ‘peace’ efforts by the Great Powers. It was also, first and foremost, a crime of staggering proportions and a major moral challenge to anyone alive who could take action to oppose it. Henry Hyndman. Source: Wikimedia Commons. 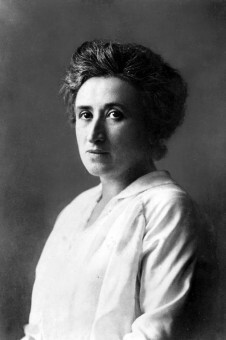 Rosa Luxemburg. Source: Wikimedia Commons. A century of horrors and atrocities across the globe suggest that the world-war-before-the-First-World-War is still far from over. So is the need for those of us in the imperial heartlands to speak out and to resist. C.J. Lowe and M.L. Dockrill, The Mirage of Power, Part III, vol. 5, Routledge, 2002, p. 479. When Churchill published these remarks a decade later he deleted the words ‘an innocent record and’ and ‘mainly acquired by violence, largely maintained by force’ (Jean Bricmont & Julie Franck (eds), Chomsky Notebook, Columbia University Press, 2007, p. 44-45). Max Hastings, ‘The Necessary War’, BBC2, first broadcast 25 February 2014. Elsewhere, Hastings has claimed that ‘France, Britain and so on, they were genuine democracies [in 1914], in a way that Germany was not’ (Jeremy Vine Show, BBC Radio 2, 11 June 2013, http://www.youtube.com/watch?v=uoJbvVTAC5s). In fact none of these countries was a democracy – at least if we take on board ‘the radical idea that women are human beings’ (Marie Schear). However, even sticking to the men, Britain was certainly not a ‘democracy’ in 1914: ‘until the Fourth Reform Act of 1918, 40% of adult males didn’t have the vote, in contrast to Germany, where every adult man had the right to go to the ballot box in national elections’ (Richard Evans, ‘Michael Gove shows his ignorance of history’ – again, Guardian, 6 January 2014, http://www.theguardian.com/books/2014/jan/06/richard-evans-michael-gove-history-education). German elites were not the only ones to espouse a ‘ruthless Social Darwinism’. As Home Secretary in 1910 Winston Churchill ‘had secretly proposed sterilization of 100,000 “mental degenerates” and the dispatch of tens of thousands of others to state-run labor camps so as to save the “British race” from inevitable decline if its “inferior” members are allowed to breed’ (Noam Chomsy, Year 501, Southend Press, 1993, p. 201). To give just one example, in 1920 British forces in Iraq, commanded by Aylmer Haldane ‘bombed and strafed rebellious tribes, fired on them with gas-filled shells [and] burned villages’. Haldane would later write that, ‘It is impossible to give the Arab casualties with any approach to exactitude but they have been estimated at 8,450 killed and wounded’ (Nicholson Baker, Human Smoke: The Beginning of World War II, the End of Civilisation, Simon and Schuster, 2008, p. 8). David Stevenson, 1914 – 1918: The History of the First World War, Penguin, 2005, p. 6. ‘A bloody history: Namibia’s colonisation’, BBC News, 29 August 2001, http://news.bbc.co.uk/1/hi/world/africa/1514856.stm. Sven Lindqvist, Exterminate All the Brutes, Granta, 1996, p. 149. Hastings, op. cit. Hastings also fails to note that Britain ‘often chose, pre-1914, to collaborate with Germany’s imperial ambitions’, including in German South West Africa where it ‘provid[ed] trade supplies via South Africa’ during the genocide (Heather Jones, ‘The German Empire’, p.61 in Robert Gerwarth & Erez Manela (eds), Empires at War: 1911 – 1923, Oxford University Press, 2014). Adam Hochschild, King Leopold’s Ghost, Papermac, 2000, pp. 226, 233. Hochschild, op. cit., p. 296. ‘Stories of deliberate sadistic mutilation [during Germany’s invasion and occupation of Belgium] are probably generally untrue’, notes Adrian Gregory (Adrian Gregory, The Last Great War: British Society and the First World War, Cambridge University Press, 2008, p. 308, n.31). At the same time, ‘malnutrition and disease, resulting from brutal military occupation policies, were responsible for the deaths of somewhere in the order of 250,000 Belgian civilians during the First World War’ (ibid., p. 45, emphasis in original). Hochschild, op. cit., p. 254. Hochschild, op. cit., p. 255. According to Hastings, ‘Once the shooting started it became plain that their war aims were little different from those of Hitler 35 years later, excepting only the Jewish genocide’ (Hastings, op. cit.). According to the historian David Stevenson, in his highly-praised history 1914 – 1918, ‘despite some continuities with pre-war policy, it appears that the German leaders first declared war and then determined what they were fighting for. Basically their objective was security, to be achieved through a network fo border buffer states and by weakening France and Russia’ (Stevenson, op. cit., p. 134). By contrast, ‘the Russians, like the Germans and unlike the British or the French, were quick to define their objectives. Having done so in the relatively favourable circumstances of the winter of 1914-15, they stood by them with little deviation through the greater difficulties that followed … They were more annexationist than [those of German Chancellor] Bethmann’ (ibid., pp. 137-138). Were the war aims of our Russian allies also ‘little different from those of Hitler 25 years later’? Hastings is silent on the topic. 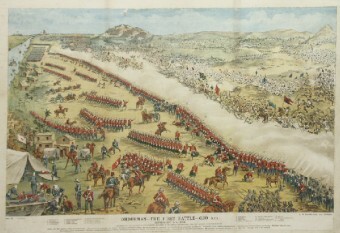 Having almost gone to war with Briain in 1898 over control of the upper Nile (‘the Fashoda incident’), France signed a series of agreements with Britain in 1904 (the ‘Entente Cordiale’), recognising British control over Egypt in exchange for British recognition of its control over Morocco. This rapidly became a de facto alliance – a key part of the international situation that enabled a Balkan conflict to escalate into a World War in a mere 37 days (Niall Ferguson, The Pity of War, Penguin, 1999, p. 64; Christopher Clarke, The Sleepwalkers: How Europe Went to War in 1914, Penguin, 2013, p. 123). According to historian Douglas Newton, ‘Britain’s choice for war was in fact made on Sunday 2 August, before Belgium was invaded’ – indeed, before the news of Germany’s ultimatum to Belgium had even reached the British Cabinet – when the cabinet agreed a pledge of naval assistance to France, and ‘was driven above all by a desire to show “solidarity” with France and Russia’ (Douglas Newton, Darkest Days: The Truth Behind Britain’s Rush to War, 1914, Verso, 2014, pp. xvii, 300). The significance of this decision has been disputed eg. David Stevenson claims that ‘as the Germans were willing to keep out of the Channel it would not have triggered British intervention’ (Stevenson, op. cit., p.35). However, its significance seemed clear to at least two of those present at the meeting that made it. Thus Churchill ‘clearly regarded the pledge as akin to war’, while Walter Runciman afterwards wrote on the top of his invitation: ‘The Cabinet which decided that war with Germany was inevitable’ (Newton, op. cit., pp. 186, 178). For example, the index for Margaret MacMillan’s mammoth massive The War that Ended Peace (which clocks in at over 600 pages) contains over 70 separate page refererences for ‘Morocco’: none of them mentions France’s 1907 shelling of Casablanca (Margaret Macmillan, The War that Ended Peace: How Europe Abandoned Peace for the First World War, Profile Books, 2014). The index does contain a reference to the ‘Casablanca incident’, but this was another diplomatic spat between France and Germany, this time over German deserters from the French Foreign Legion. Susan Gilson Miller, A History of Modern Morocco, Cambridge University Press, 2013, pp. 94, 96. Douglas Newton, British Labour, European Socialism and the Struggle for Peace, 1889 – 1914, Oxford University Press, 1985, p.172. ‘Pact between predators’ is Newton’s gloss. Maciej Bartkowski, Recovering Nonviolent History: Civil Resistance in Liberation Struggles, Lynne Rienner, 2013, p. 151. W. Morgan Schuster, The Strangling of Persia, Century Co., 1920, p.xxxv. Bartkowski, op cit., p. 154. Schuster, op cit., p. 219. Clarke, op. cit., p. 152. Greg Grandin, Empire’s Workshop: Latin America, the United States, and the Rise of the New Imperialism, Metropolitan Books, 2006, p. 22. Hans Schmidt, The United States Occupation of Haiti, 1915-1934, Rutgers University Press, 1995, p. 106. The following exchange, between Max Hastings and Marxist historian Neil Faulkner, taken from a June 2013 edition of the Jeremy Vine Show (op.cit. ), is highly revealing in this respect. As we have seen, Hastings is perfectly happy to cite German colonial atrocities to bolster his case, but if anyone dares to mention British crimes then they are being ‘masochistic’ and ‘flagellatory’ and ‘rubbishing Britain’. Adam Hochschild, To End All Wars, MacMillan, 2011, p.18; Lindqvist, op cit., p. 67. Ibid., pp. 652 – 653. Toyin Falola, Colonialism and Violence in Nigeria, Indiana University Press, 2009, p. 19; Pakenham, op. cit., p. 653. Mike Davis, Late Victorian Holocausts, Verso, 2000, pp. 161, 175. Davis, op. cit., pp. 162, 169. Davis, op. cit., pp. 164, 175. In his 1923 book Labor and Empire, the Chinese historian Tingfu F Tsiang defines imperialism, firstly, as ‘the process of gaining control, partial or complete, of other peoples and lands for the political advantage, fancied or real, of the home people and country’. Secondly, as ‘the process of keeping such control, once gained, in opposition to the expressed wishes of the people so controlled’, and thirdly as ‘the augmentation of armaments on land and sea and the formation of diplomatic alliances, understandings and accommodations for the purpose of adding to or keeping empires’ (T’ing-fu Chiang, Labor and Empire: A study of the reaction of British labor, mainly as represented in Parliament, to British Imperialism since 1880, Columbia University, 1923, p. 26). With some caveats eg. to recognise the phenomenon of internalized colonialism and the fact that neither ‘home peoples’ nor ‘countries’ are usually actors on the world stage, this seems like a useful definition. According to Tingfu F Tsiang, ‘the predominant characteristic of the reaction of British Labor to British Imperialism in Africa from 1880 to the 1920s is acquiescence’ (Newton, op. cit., p. 58). The situation in Germany appears to have been somewhat different, at least for a time, with the German Social Democrats (SPD) ‘put[ting] German colonial brutality at the centre’ of its campaign for the 1907 elections to the Reichstag (Harry Harmer, Rosa Luxemburg, Haus Publishing, 2008, pp. 68 – 69). 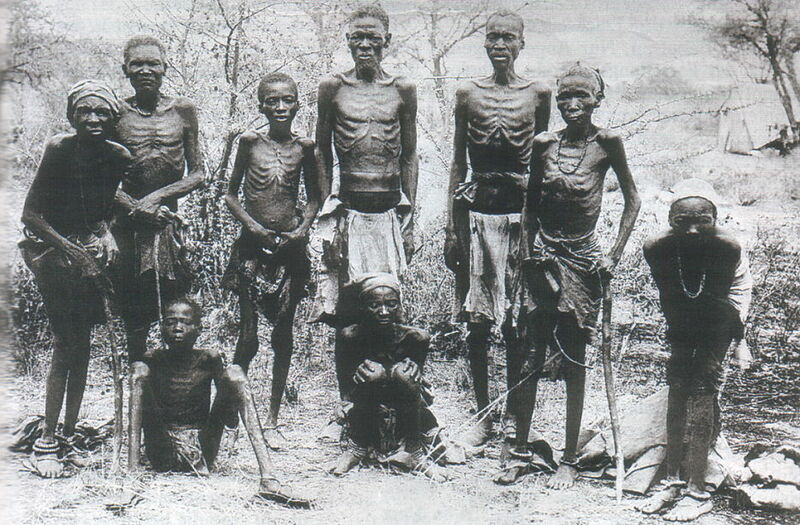 Of course, as is still the case today, atrocities committed by official enemies could be – and were – loudly denounced, with the result that pre-war German atrocities in Africa ‘became a central tenet of British wartime propaganda’, despite Britain’s de facto support for them at the time (Jones, op. cit., p. 66; see note 9. above re. British support). Newton, op. cit., p.61. 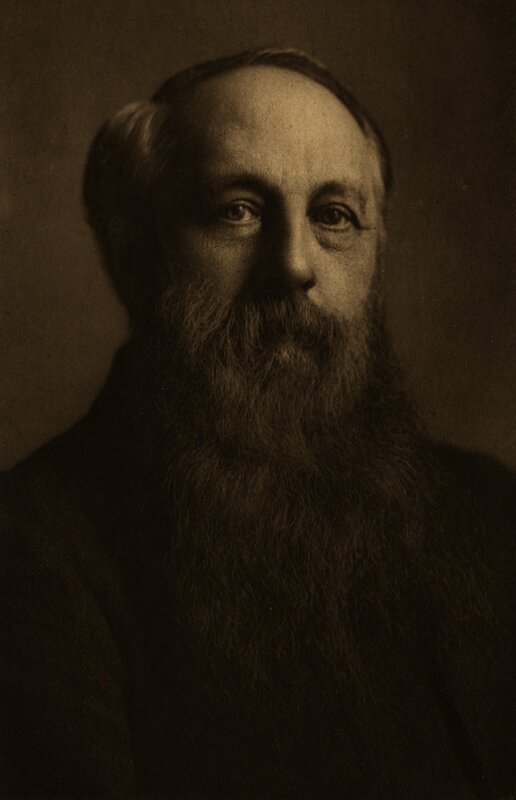 Hardie visited India in 1907, where he ‘openly denounced the character of British rule’ there, describing the latter, in his book India: Impressions and Suggestions, as ‘a huge military despotism tempered somewhat by a civil bureaucracy’. However, he ‘he did not argue for the immediate withdrawal of the British from India, but only for the gradual extension of self-government as had recently been implemented in Australia and South Africa’ (Kenneth Morgan, Keir Hardie: Radical and Socialist, Weidenfeld and Nicolson, 1985, pp. 192, 194-195). Davis, op. cit., pp. 141 – 143. According to Davis, Hyndman’s Social Democratic Federation (SDF) ‘was the only British political organization which never wavered in its attention to India’s famine victims’ (p. 165). Whatever his feelings about British imperialism, Hyndman would go on to support Britain in the First World War. Harmer, op. cit., p. 80. Ibid., p. 83. When the war came Luxemburg opposed it from the start, and was eventually interned as a threat to the state (ibid., p.107).